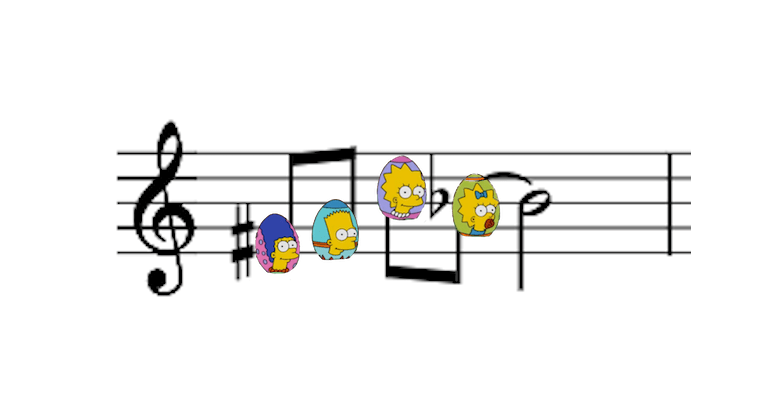 There is an Easter egg in the theme for The Simpsons. It jumped out at me the first time I saw the show, probably 1990, and I was immediately convinced that composer Danny Elfman meant to do it. This morning I decided to find his email address to ask him. In the process of looking for his email, I learned that Elfman’s violin concerto Eleven Eleven just premiered at Stanford’s Bing Hall, and realized that asking him about the goddamn Simpsons theme is like saying “Hello? Is it me you’re looking for?” into Lionel Ritchie’s answering machine, and I recognized that The Simpsons is the equivalent of a catchphrase for Elfman, a good thing that you spawned long ago that continues to nip at your heels for the rest of your life, and that asking about The Simpsons instead of Eleven Eleven in 2018 is like walking up to De Niro on the street and saying, “You talkin’ to me?” and thinking one’s self very clever, so I stopped looking for his email address. But still, there’s this Easter egg in the theme for The Simpsons. Those exact pitches in that exact shape and rhythm, appearing by chance in The Simpsons? Naw. It’s homage, I tells ya, homage. But only Danny Elfman knows for sure, and I’m not asking.